Ilyushin Il-76 seen in Top Gear. The Ilyushin Il-76 is a multi-purpose 4-engined strategic airlifter designed by the Soviet Ilyushin bureau. It was first planned as a commercial freighter in 1967 but subsequently as a replacement for the An-12. The Il-76 was designed for delivering heavy machinery to remote, poorly-serviced areas of the USSR. 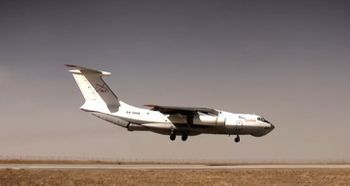 Military versions of the Il-76 have seen widespread use in Europe, Asia and Africa, including use as an airborne refueling tanker or as a command center.The Il-76 has seen extensive service as a commercial freighter for ramp-delivered cargo, especially for outsized or heavy items unable to be otherwise carried. It has been used as emergency response transport for civilian evacuations and to deliver humanitarian/disaster relief aid around the world, especially to undeveloped areas due to its ability to operate from unpaved runways. A water-carrying version of the plane has been effective in fire-fighting. This page lists all films that feature a variation of the Ilyushin Il-76. Pages in category "Ilyushin Il-76"